KARNES CITY, Texas, September 20, 2013 (ENS) – In the five years since the shale boom hit, the once-beautiful hills of south Texas have been transformed into a scarred, industrial landscape. The residents’ health is part of the collateral damage, according to the environmental watchdog group Earthworks. Their new study documents hazardous chemicals in the air and serious ailments reported by families living in close proximity to drilling operations. The Earthworks report is the latest in a series of publications exposing potential health risks associated with hydraulic fracturing for oil and natural gas. But their report, “Reckless Endangerment While Fracking the Eagle Ford Shale” goes farther. It provides a scathing analysis of government oversight and industry responsibility in a place where new wells are being drilled daily in a virtual gold rush. In Karnes County, the heart of the 400-mile Eagle Ford shale play, the skyline is dotted with burning flares and glaring floodlights, making the Texas night shine as brightly as the Las Vegas Strip. The region’s first frack well was drilled in 2008; by February of this year, 625 oil wells and 182 natural gas wells were working 24/7. As of April, the Texas Railroad Commission had issued 9,459 Eagle Ford drilling permits. The rush has barely begun. Marathon Oil Corporation’s CEO, Clarence Cazalot, characterized the region as the most promising oil and gas discovery in North America, possibly the world. There are at least another 85,000 wells left to drill in the Eagle Ford, according to estimates by DrillingInfo, a research firm. Shale wells deplete quickly: in North Dakota’s Bakken Shale, about 90 new oil wells must go online each month to keep production stable. For this study, Earthworks Oil and Gas Accountability Project, OGAP, requisitioned government records, conducted independent air tests, used infrared still and video cameras, and spoke with affected Karnes County families, including the Cernys. 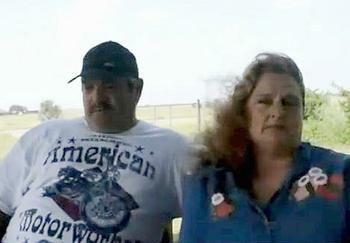 A section of the OGAP report describes life in a frack zone through this family’s eyes. Myra Cerny contacted one of the report’s authors, Sharon Wilson, back in 2012 because they were sick. She, her husband Mike, and their 15-year-old son, Cameron, suffer from a plethora of symptoms, from bone pain, rashes, and migraines to daily breathing issues and chronic bronchitis. Cameron has frequent nosebleeds and suffers from joint pain and other problems rarely found in teenagers. Mike’s blinding headaches prompted his doctor to order a CT scan. They live on antibiotics, painkillers and inhalers. The family is living in the midst of an industrial zone. Eighteen wells sit within a mile of their house, 37 wells are within two miles – a normal density for the region – and there are several processing facilities. Since the first rig arrived three years ago, drilling and fracturing have been constant. Sometimes a few rigs operate simultaneously. The chemical rotten egg stench can be overpowering, making the Cernys dry heave, eyes watering. Hydraulic fracturing, or fracking, pumps millions of gallons of water mixed with sand and perhaps 500 chemicals deep underground to shatter shale bedrock and release the oil and natural gas trapped below. An ongoing study by the Southwest Pennsylvania Environmental Health Project has shown that air pollution from the process poses the greatest human health threat. During drilling, fracking, flaring and venting operations, a host of hazardous airborne chemicals have been detected near the Cerny’s home. 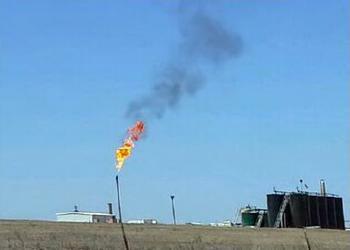 Studies by the Colorado School of Public Health and others have proven the presence of these and other pollutants near frack sites, and the health impacts of those chemicals are well understood. The family’s repeated complaints finally prompted a Texas Commission on Environmental Quality investigation. It found that dozens of hydrocarbons were released into the air, including chemicals capable of harming the brain and nervous system and impacting child development. The air carried hydrogen sulfide, which can cause dizziness, headaches and breathing and heart problems; toluene, a source of fatigue, neurological problems and kidney damage; benzene, prolonged exposure to this chemical can cause leukemia; and a host of other chemicals. Proving conclusive cause and effect from environmental exposures is always difficult. But Wilma Subra, an environmental scientist and a co-author of the Earthworks report, said that the Cernys’ health complaints correlate closely with those expected from these chemicals. The inspectors vacated the site, but took no further action to reduce the emissions, cite the operator, nor warn or help affected residents, according to the report. In December 2012, Marathon Oil vented a petroleum storage tank during 12-hour period about a mile from the Cernys’ front door. Emissions of hydrogen sulfide reached 112 times the maximum allowable rate, while volative organic chemicals topped 500 times the permitted amount with levels more likely to be found near an oil refinery. Though TCEQ issued violations for equipment that failed to contain toxic releases, for excessive emissions and late reporting, Marathon has paid no penalties. Wilson notes that the Cernys’ experience is not unique. “Families are trapped living with toxic pollution. What this report shows is the naked reality of living with rapid oil and gas development,” she said. Under the law, fracking companies may legally release hundreds of tons of dangerous air pollutants each year. OGAP maintains that Eagle Ford is a microcosm that stands as example for a national problem. Loopholes in the Clean Air and Water Acts and Safe Drinking Water Act combine with widespread equipment failures, industry shortcuts, accidents and human error to create too-frequent hazardous releases. Earthworks points out that citizens in frack zones are being poisoned, government agencies are failing to take action to protect them, and drillers insist there is no public health threat. “From the regulators in Texas to the United States EPA, government agencies are running away from their own data showing that fracking pollution is harming communities,” said Jennifer Krill, Earthworks executive director. Wilson has watched too many people suffer. “Governor Perry and President Obama need to pull industry’s money out of their ears so they can hear the cries of the people,” she said.